Trailer Hitch. MP3 Player, 4x4, Chrome Wheels, 4-Wheel ABS, 4-Wheel Disc Brakes. 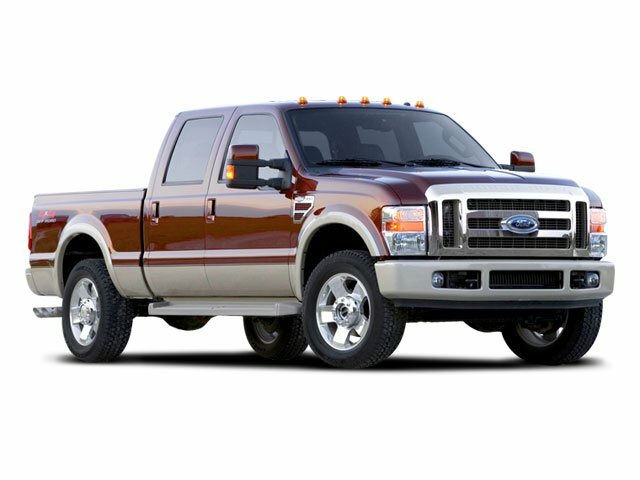 6.4L OHV V8 TURBO-DIESEL POWER STROKE ENGINE 135-amp HD alternator, dual 750 CCA battery, turbo boost gauge, air filter minder *Includes Winter Front Grille Cover in AK, CO, ID, IA, ME, MI, MN, MT, NH, NY, ND, SD, VT, WI, WY*, (4) LT275/70R18E ALL-TERRAIN OWL TIRES (4) premium forged polished 18" aluminum wheels, 6-WAY PWR DRIVER & FRONT PASSENGER SEATS, POWERSCOPE PWR TELESCOPING & FOLDING HEATED TRAILER TOW MIRRORS turn signals, integrated clearance lights, 3.73 AXLE RATIO W/LIMITED SLIP REAR AXLE, ADVANCED SECURITY GROUP autolamp, remote keyless entry w/(2) key fobs & panic feature, illum entry, driver side wired keypad (w/44T or 44B Auto Trans auto-lock/-unlock), PREMIUM AM/FM STEREO W/IN-DASH 6-DISC CD CHANGER MP3 capability, auxiliary audio input jack, clock, leather-wrapped steering wheel w/audio controls, REVERSE VEHICLE AID SENSOR, ADJUSTABLE GAS & BRAKE PEDALS. Ford XLT with Dark Shadow Gray Metallic exterior and Black interior features a 8 Cylinder Engine with 350 HP at 3000 RPM*. .
"Serious work capacity, a comfortable cabin, an abundance of useful features and refined road manners make the Super Duty a serious contender for the top heavy-duty pickup title." -Edmunds.com. LOCATED IN RUSHVILLE! Pricing analysis performed on 4/20/2019. Horsepower calculations based on trim engine configuration. Please confirm the accuracy of the included equipment by calling us prior to purchase.